Rewards Canada: Tell us your Distinction plans for a chance to win 25,000 Aeroplan Miles! Tell us your Distinction plans for a chance to win 25,000 Aeroplan Miles! BIG NEWS from Aeroplan! Seven Year Mileage Expiration being canceled, one way mileage awards being lowered, TD Bank to issue Aeroplan Credit Cards and more! The contest closes on Friday October 18 at 11:59pm EST! Winner will be determined by random draw from all eligible entries received. Open to Canadian residents over the age of majority. No purchase necessary. Winner will be required to answer a skill testing question. 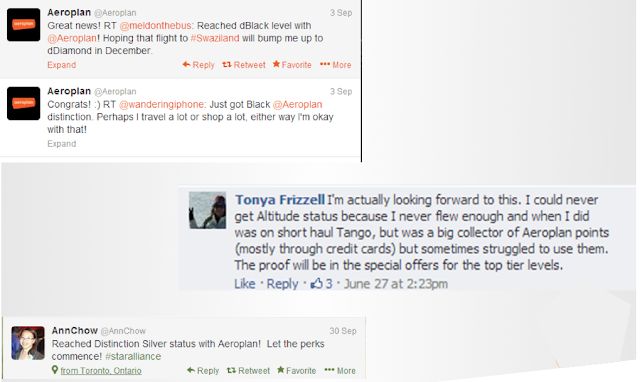 I'm making more purchases in the Aeroplan online shopping portal, hoping to achieve Distinction Silver. I've still not figured out the pros and cons of Distinction for me but I'm hedging my bets and putting more on this card as I'm just short of Black. Almost to Diamond. Just about to book flights for our 20th wedding anniversary for next year. Today is our 19th. Now that I am retired, I am looking forward to Distinction and hope to make at least silver every year. i've qualified for dsilver already, but i'm 20k short of dblack. having an aerogold card, it would be nice to reach it, for the 10k bonus miles, but the benefits aren't really that impressive, and i don't have much travel coming up. i still spend on my card, and go thru the estore when possible, but it's too far away, i'm afraid. Achieved dSilver this year thanks to the CIBC bank account promo counting as distinction-earning points. Looks like dBlack will be a long way off so I'll be using the aerogold for all of my purchases and keep chipping away at it. Silver in short order for me, while my partner is verging on black, mostly off credit cards. I also love the e-store multiplier that comes with each level. I'm currently dSilver and will hit dBlack within a month, which should give me the 15K miles bonus for have an Aeroplan affiliated credit card next year. However, other than the one time bonus, it doesn't seem like distinction will have much value for me. I would never waste my points on an overinflated "Market Fare Flight Reward" even with the 25% discount. The special distinction flights are probably mostly out of Toronto and I usually plan my vacations well in advance, so I wouldn't be able to take advantage of the short time horizon on these events even if the special flights were flying out of Vancouver and going somewhere I wanted to go, when I wanted to go. In fact, the only thing that will be of any real advantage is the 2x bonus for Aeroplan store purchases, but even that is a very limited bonus. To quote Macbeth rather out of context, other than the one time bonus in March, the distinction program is "full of sound and fury, signifying nothing". Using Air Canada for corporate and personal flights whenever possible! I should easily make Diamond status ... 9000 points short. Looking forward to using the points on a mini-RTW trip for myself and the family. Also hope that the discount on classic rewards is actually going to be a boon for Black and Diamond members. Focusing on using as many Aeroplan earning opportunities, hopefully I will make it to dBlack. More chances to travel see my family. Yeah ! I've got a few small trips to plan so I may get to silver. May event picky as to where I tank up at. Credit card spending all on Amex Aeroplan platinum and flying flex Weeks away from Diamond status! Earned black but I don't fly enough to get to Diamond. I'll keep trying with Sobey's, Esso, Rexall and so on....you never know!!! I'm signing up for as many Aeroplan web promotions as possible 'cos you never know which one will be valid to my needs. I'm also participating on direct retail usage. Hopefully with all the usages, I'll earn Distinction Silver level for 2014. I am hoping to achieve dSilver status and I am doing online purchases on aeroplan estore with my amex gold aeroplan card to double dip points. Almost there! Just a few steps from silver.. even if I don't understand why we go climb from silver to black to diamond? What was wrong with bronze, silver and gold level names? Whatever.. as long as it give us more for the extra efforts and expenses to collect these precious points! Took a flight to Europe on a partner airline and that gave me almost 10000 points! Well on my way Black, plus I have a aeroplan visa and shop at partners like esso all the time. Only 14000 miles until Black hope I make it! Taking advantage of earn your wings promo! Not sure what it all means but tracking to dblack by taking advantage of AC, Aeroplan and hotels bonuses that are highlighted on this site! I have already achieved Diamond status. I am an avid collector of Aeroplan, using my Aeroplan credit card for all purchases as well as renting cars every weekend which gives me quadruple miles with Hertz. I'm hoping to just reach Silver status by the end of the year. I'm using the eStore and my Aeroplan credit card to earn points. I will be at least Silver and hope to get Black by end of the year. I am at Silver and using the e-store on Aeroplan to earn more! Also, looking forward to the "Star Challenge" around April to bump me up! I also hope to reach silver. Being a student it's difficult to manage 25000 miles even though I went to London and going to Montreal soon. Rest of the points I got from purchasing gas for my car at Esso. But anyway Aeroplan rocks for me! Hoping to get dSilver by 2014. Planning a trip to the Caribbean in the spring! I'm a bit skeptical about the benefits of the Distinction program, but I'll continue to pile on credit card points to get status. We'll see what 2014 brings in terms of real value in the program. Hope to hit silver this year with cc, some flying and gas purchases. I intend to travel more now that I am retired. Hoping to achieive dSilver. Hoping to achive dSilver by December, a few trips planned for 2014. Love that Air Canada added this rewards program' nice to be able to achive status from the ground. i'd like to achieve silver, as i plan to travel more in the upcoming year.